Eating habits of cultures are dependent on the geographical and climatic conditions in the regions in which they live, as well as their modes of agriculture and animal husbandry and socio-economic conditions. Generally, the most produced foodstuff in a region gains status as their staple food and is present at all meals. However as people move from closed self-sufficient economies to market economies, they sell their agricultural and animal products for money and turn towards more industrially-produced foods, or new foods that attract them. Thus certain changes take place in their foods and consumption patterns. The staple food of the Turks is wheat, consumed in the form of flour, bulgur and cracked wheat. The second most consumed grain is rice. Corn is much consumed in the Black Sea region but relatively little in remaining areas. Although meat, and especially mutton, has historically been one of the staple materials in Turkish cuisine, this is less and less true today. Meat is generally served in small amounts, mixed with vegetables and grains. The oils and fats used in Turkish food vary according to region. The most common are olive oil in the Aegean region, and sunflower oil in Thrace. In the East, Southeast and Central Anatolia, clarified butter is much used, but this is now widely substituted by margarine. Today the most used oils in foods are margarine, vegetable oils and olive oil. The decrease in the amount of meat used in cooking has been met by the increased use of oils. One of the typical characteristics of Turkish cooking is the mixture of foods from various food groups in one dish. Thus one dish may supply a balanced diet. 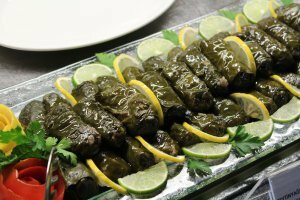 At the top of the list of such foods are köfte, sarma and dolma. The basic ingredient in köfte is double-ground meat. One example of a köfte is the American “hamburger,” but in Turkey, the meat is never used alone. It is always combined with other ingredients such as bread crumbs, rice, fine bulgur, tomatoes, onions, parsley and eggs, which add flavor, texture and extra bulk, as well as spices and herbs. 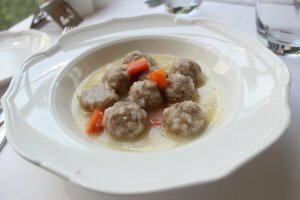 In addition, due to the expense of meat or its limited availability during some seasons, a tradition of making meatless köfte from combinations of bulgur, cracked wheat, lentils and vegetables has also developed. 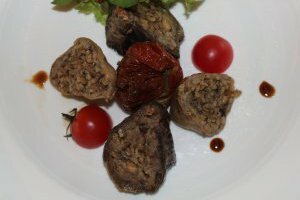 Köfte are made and cooked in a variety of different ways, and according to how they are made, ingredients and the vessel in which they are cooked, they are called by different names. Table 1 gives examples of different köfte according to region. In the Southeast, the East and the Mediterranean regions, the main ingredient for köfte is bulgur. This fine bugur is variously named düğü, düğ, düğürcük and köftelik bulgur. The combination of fine bulgur with other ingredients and different cooking methods gives rise to several different types. For example, sixty-four different types of köfte are made in the Malatya region. 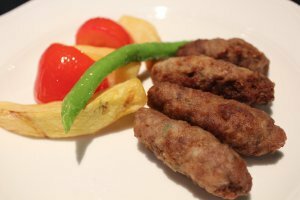 The most nutritious köfte are those which contain a combination of meat, bulgur and vegetables. Those made with legumes instead of meat are similarly nutritious. Served generally with ayran, a drink made from yogurt mixed with water, they provide a balanced meal, especially when cooked together with vegetables such as pepper, tomatoes, eggplant and onion and eaten with bread as well. 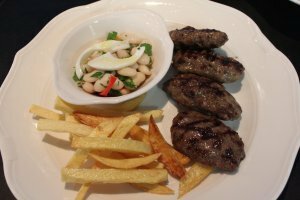 In this way, quite the opposite of a hamburger, 1 portion of köfte does not contain excessive amounts of saturated animal fats. 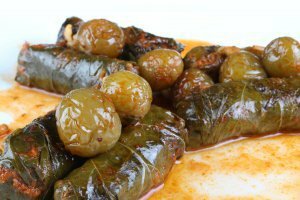 Sarma (< Turkish sarmak, “to wrap”) and dolma (< Turkish dolmak, to be filled, stuffed) comprise two groups, those eaten hot and those eaten cold. 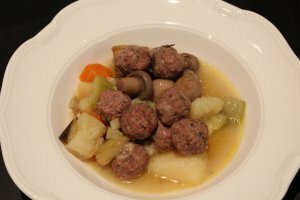 In cookbooks these are classified into those with meat, etli, eaten hot, and zeytinyağlı, “with olive oil,” which are meat free and eaten cold. 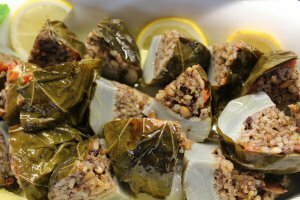 But today in various regions, some sarma and dolma are made without meat, and made with vegetable oil, clarified butter or margarine, and served hot (Table 2). 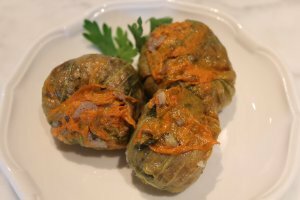 Sarma and dolma consist of a filling inside of a vegetable. 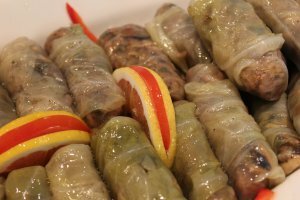 Hot dolma and sarma have various fillings. The first group consists mainly of rice and ground meat, the second of bulgur or cracked wheat, the third of bulgur and a small amount of kavurma (meat cooked in its own fat), the fourth, of legumes and bulgur, and the fifth, of ground meat and bulgur. 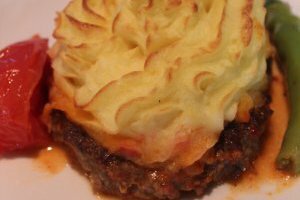 Other ingredients common in most of them include finely chopped onion, parsley, dill, mint, tomatoes or tomato paste, butter or margarine, or vegetable oil. The use of herbs varies as well. 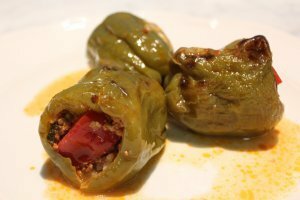 The chief vegetables used for dolma are peppers, zucchini and eggplant. Others include tomatoes, leeks, celeriac, artichokes, beets, squash blossoms and onions. Peppers and eggplants in particular are strung on a string to dry, and used for dolma during the winter. 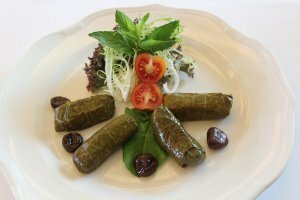 Dolma may be made from a single vegetable or of several cooked together.